Five HAHS juniors participated in this year's Camp Neidig from June 16-June 18. Quinn Bucheit, Joey Dalton Jr., Ashley Lojko, Lydia Warner, and Lyndsey Carr joined almost 120 other campers from across southeastern Pennsylvania to practice team-building skills, learn about leadership, and enjoy many fun activities. 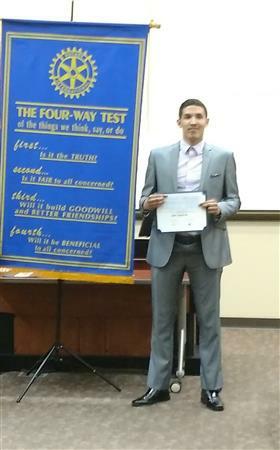 Jose Galarza, Jr. placed third with his speech on meeting the needs of senior citizens in the West Region 4-Way test Speech Contest held Saturday, April 22, at Kutztown University. Jose competed against students representing Rotary Clubs from Kutztown, Fleetwood, West Reading/ Wyomissing, Conrad Weiser, and Reading. Ayla Blatt of Kutztown placed first for her speech on the value of buying local produce and Rachael Maurer of Conrad Weiser placed second for her speech on helping the homeless and lifting up those in poverty. Jose was awarded a certificate and $100. 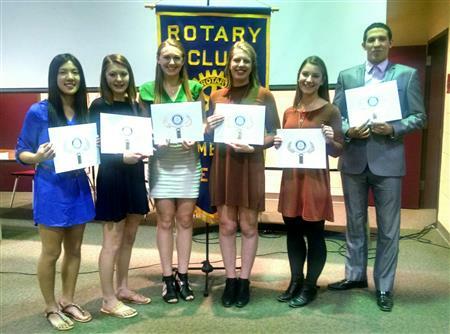 Pictured from left to right are HAHS sophomores Jenny Chen, Julia Doklan, and Haley Savastano; juniors Eliza Moseman and Grace Kutz, and home-schooled senior Jose Galarza, Jr. All contestants received a certificate for participating. Haley Savastano won $25 for Fourth Place in speaking about GMOs. Eliza Moseman won $50 for Third Place in speaking on Portfolio-based assessment. Grace Kutz , second place speaker, won $100 for discussing Affordable Health Care, and Jose Galarza, first place speaker, also won $100. He spoke on meeting the needs of senior citizens. Jose will go on to compete in the regional contest to be held April 22 at Kutztown University. If Jose is not able to compete that day, Grace Kutz will then represent the Hamburg Rotary. The second annual 4-Way Test speech Contest was held at Hamburg Area High School on Thursday, February 18, 2016. Four HAHS students competed, giving 5-7 minute persuasive speeches on a topic that met the criteria of the 4-Way Test. Yelitza Pagan a junior, won first place for her speech on "Benefits of Teenage Employment." Sophomore Eliza Moseman won second place for her speech on Immigration. Jose Galarza, also a sophomore, won third place for his speech on Homeless Veterans. Honorable Mention was won by Dominic Lombardo, a freshman, for his speech on Leadership. 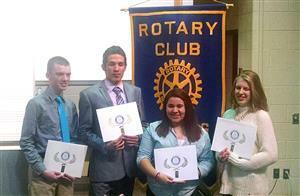 These students each received certificates and checks for $100, $50, $25, and $25 respectively. Christine Roth was Contest Chair; Judges were two Rotarians, Titus A. Miller III and Beth A.Heckart, and Lori Donofrio-Galley of the Northeast Berks Chamber of Commerce. Also assisting at the contest were Rotarians Eric George, timekeeper,and Martha Bertolet and Donna Palko, tellers. 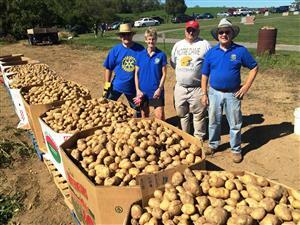 Several Rotarians participated in the Potato Project on Sunday, September 20 at a farm outside of Shoemakersville. Pictured next to the results of the harvest are (L to R) AG Bob Hobaugh, President Kim, Bob Delong, and Titus Miller. 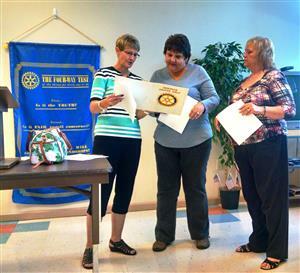 Donna Palko is the newest member of the Hamburg Rotary Club inducted at the club meeting of September 17. Pictured from left to right are President Kim, Donna, and Beth Heckart who sponsored Donna. 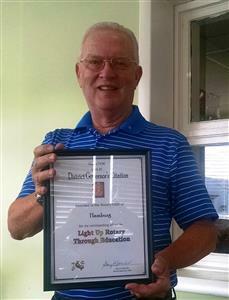 Rotary Club of Hamburg received the District Governor's Citation for its outstanding effort to "Light up Rotary Through Education" at the District Changeover Dinner June 29, 2015. 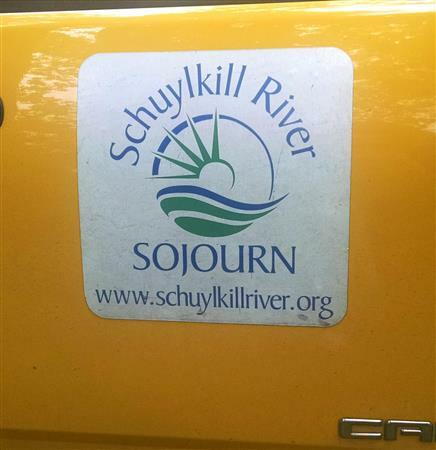 Past President Titus A. Miller, along with Trude Miller and club members Elaine Swavely and Allen Shollenberger , attended. 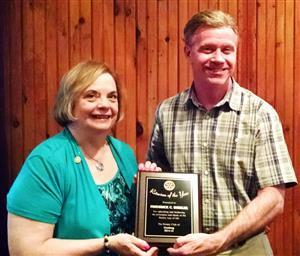 Frederick C. Sheeler was named Hamburg's Rotarian of the Year at the President's Night Dinner held June 26, 2015. Christine L. Roth presented Fred with a plaque recognizing his dedication to the principles of Rotary.